Former bassist/vocalist for seminal gothic rock band Bauhaus, and later psychedelic rock band Love and Rocks, releases his 7th solo album, Estranged, on the San Francisco-based Heyday Records. 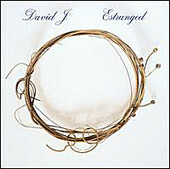 Incorporating influences of his goth/rock fame, David J. also leans heavily on folk-rock, adult alternative, country, and pop-rock to create a rich, layered record that is well produced, nicely arranged, and precisely delivered. The record has its moments, including far-reaching pop hooks, laid-back, folk-country tenderness. And though there are some moments that seem too labored over, too lifeless, the flow of the album is such that the record often has sounds optimized with listened to from start to finish. Done in that fashion, the songs play on each other and read like a good book, where missing a song or two could leave you clueless. The record is a strong offering from a gifted songwriter, and despite its tired flaws, David J. puts his all into it and delivers some of his best solo moments. I'll give it a B.